Do You Have A Mold Damage Restoration Project We Can Help With? DISCOVERING MOLD IN YOUR HOME OR BUSINESS CAN CAUSE ANXIETY. 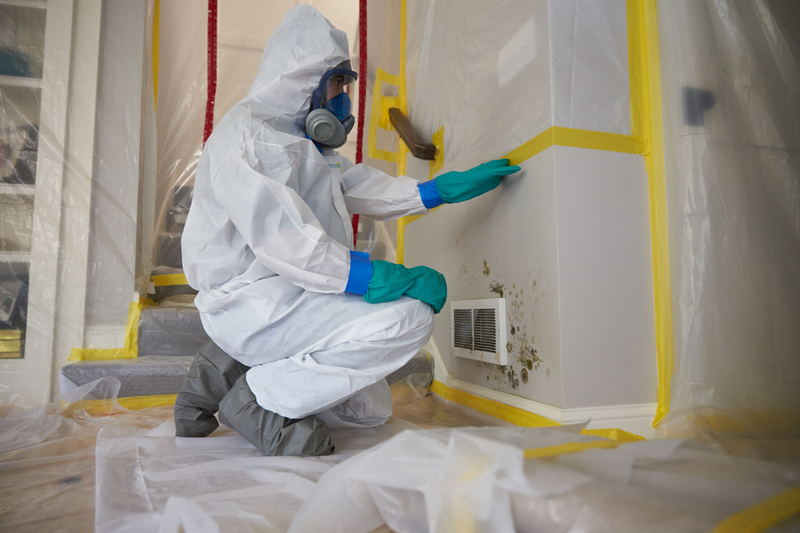 Concerns about what kind of mold may be surrounding you, the detrimental effect it may have on your building’s structure, and whether or not it is safe to even breathe may be causing stress. To begin the mold abatement process, we use our exclusive InstaScope® airborne mold detection system for business and home mold testing, which provides real-time, instant results identifying the exact spores present on surfaces and in the air. InstaScope® testing is offered free of charge with our mold removal service, so we spend no time eliminating unhealthy mold and getting your property back to it’s original standing. We directly bill your insurance and offer financing. We offer 24 hour, 7 day a week assistance to consult, give mold damage assessments, and help you find temporary shelter– even in the middle of the night. We being by testing the air quality in your home or business using our exclusive InstaScope® airborne mold detection system. After detecting the specific mold type and source, we begin mold remediation by sanitizing and deodorizing areas and items affected. The most common types of mold we treat include: aspergillus, cladosporium and stachybotrys atra (also known as black mold). Using our specialized mold removal products, we clean walls, carpets, fabrics, drapery, upholstery, furniture and other contents in your home or business and get rid of mold spores, wherever they exist. We provide professional carpet cleaning services, aiming to refresh and recover your space and remove offensive odors and stains. We respond immediately, rebuilding after mold damage or corresponding water damage has ruined part of, or all of your structure. Our construction business handles emergency roof repair, concrete foundation repair, and other property damages. We also provide the finish services that are often needed after mold damage such as drywall removal and replacement, replacement of damaged framing, and drywall finishing and painting. Repairing damage from smoke, wind, water, mold, and other disasters, we help get your life back to normal. ServiceMaster Restoration by BTM has been helping residential and business customers deal with the eradication of damage from smoke, water, and mold since 2001. Serving customers throughout Northern Kentucky and Cincinnati, Ohio, we take great pride in being stewards of our community.